Introduced in 2014, enlighten™ is the most advanced laser system for the effective and safe removal of tattoos on the market. 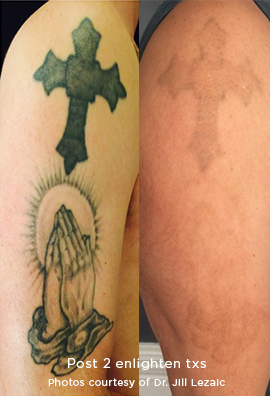 HOW DOES ENLIGHTEN LASER TATTOO REMOVAL DIFFER FROM OTHER LASER TATTOO REMOVAL OPTIONS? enlighten features extremely short and high-power picosecond laser pulses which efficiently and quickly break down the ink particles in tattoos. A 'picosecond' is one-trillionth of a second, and is 1,000 times shorter than the 'nanosecond' pulses used in existing lasers for tattoo removal. Melasma is a tan or dark skin discoloration. Although it can affect anyone, melasma is particularly common in women, especially pregnant women and those who are taking oral or patch contraceptives or hormone replacement therapy (HRT) medications. Melasma can not be completely cured, however effective treatment are possible. This is because your skin is extremely sensitive to UV and even the smallest amount can stimulate your pigment cells to produce color. The mainstay of treatment is strict UV protection- hats, sunglasses and SPF every 4 hours. 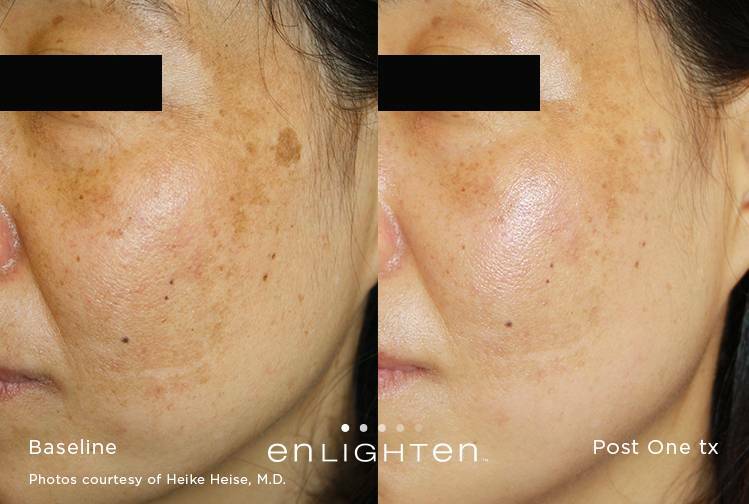 Cutera enlighten™ is suitable not only for tattoo removal, but pigmented skin lesions (melasma, hyperpigmentation, sun spots) and skin revitalization as well. Who said tattoos are designed to last forever? Call now to schedule a complimentary consultation. Thanks to the revolutionary advancements in laser technology, enlighten™ will quickly rid you of what you would like to forget. 985-641-5476.
jNews Pro 9.0.3, Joomla extensions powered by Joobi.